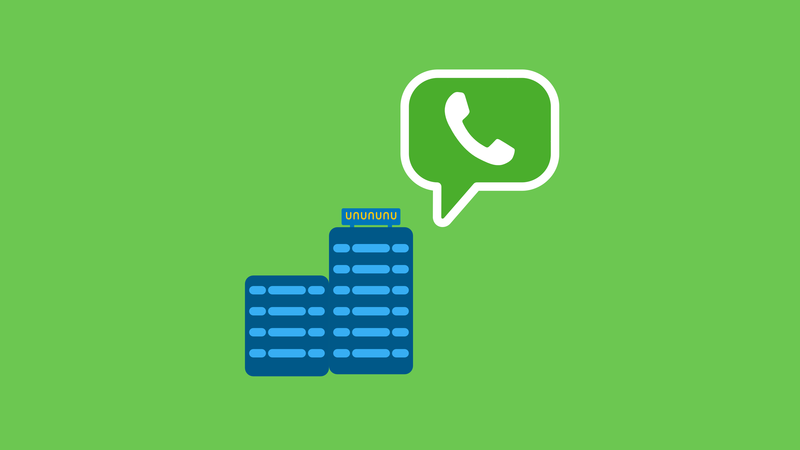 Customer service and WhatsApp – this is the current trend for companies and customers alike! Customers want answers to their questions, and they want them fast. In our fast-moving environment, no one has time to be on hold for 10 minutes before even being able to reach out to an employee. 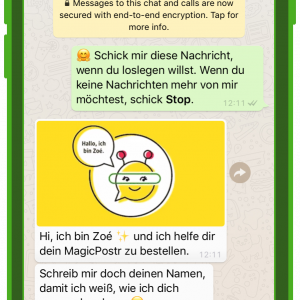 Customer service via messaging apps is the future! Fast and flexible – what more could you want? 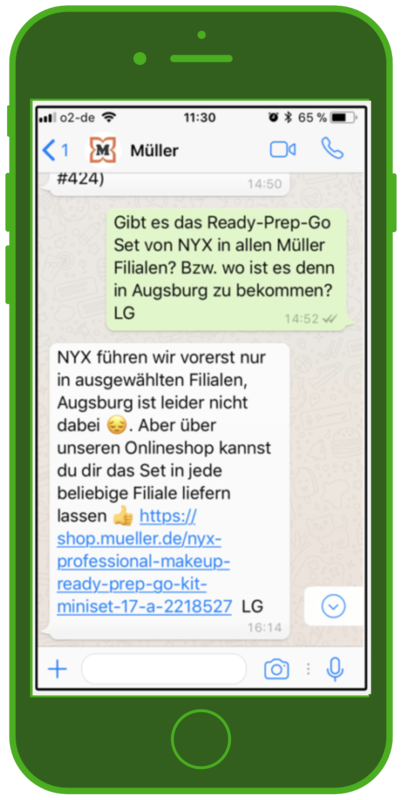 Together with German research institution YouGov, MessengerPeople conducted a study that empirically confirms the trend towards customer communication via 1:1 chats in mesasging apps – especially for e-commerce. 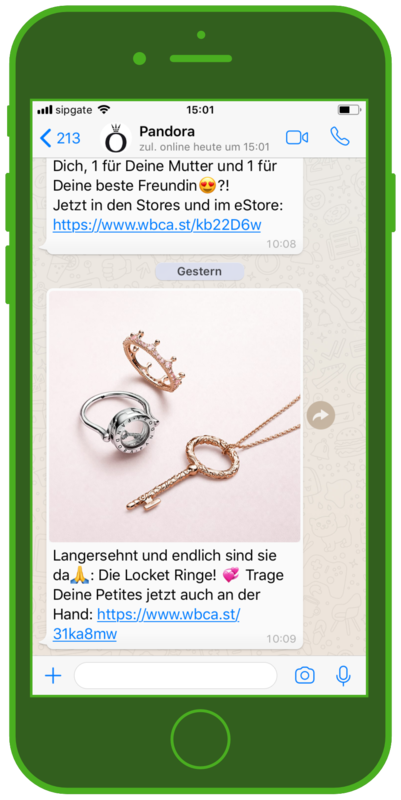 According to Facebook’s More than a message study, 53% of the respondents say they are more likely to shop with a business they can contact via a chat app. 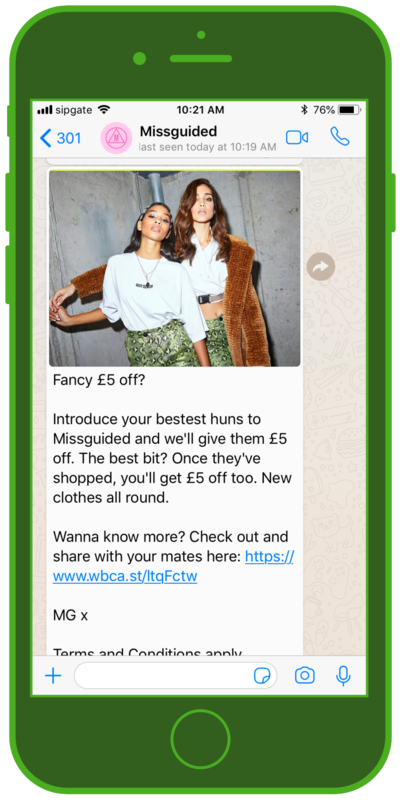 Retailers like the british Threads, a luxury fashion retailer, shows how disruptive shopping looks like these days: Their customers can purchase the luxury items via WhatsApp and WeChat — Threads has neither a physical shop nor an online store on their website! 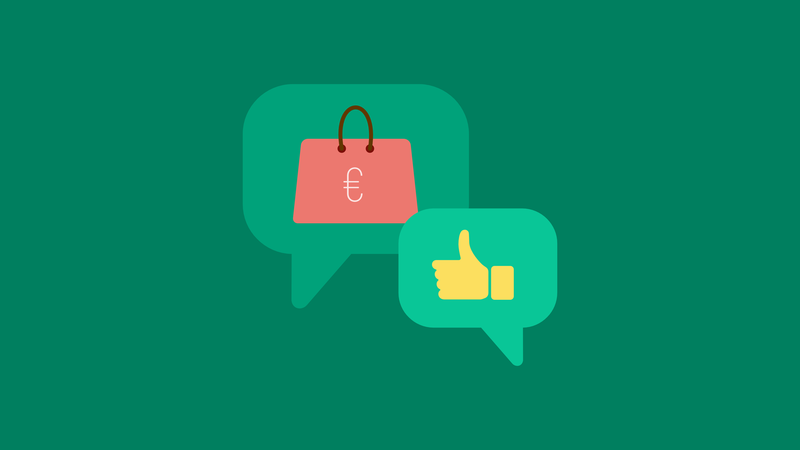 Especially for e-commerce businesses, it’s key to offer the highest quality customer service, or else customers will turn to competitors without hesitating. 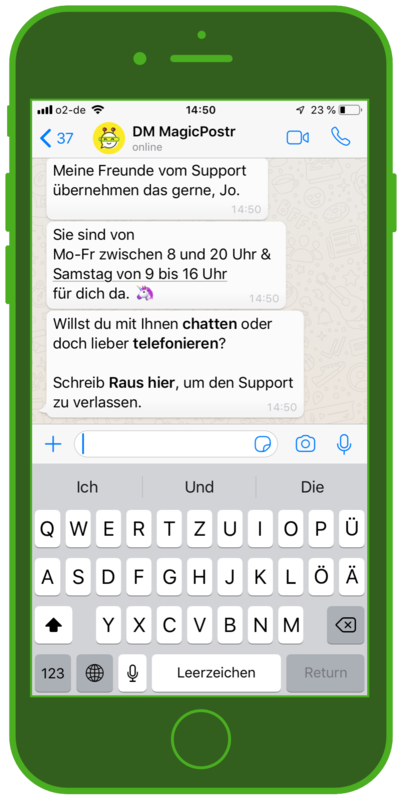 As a consequence, 1:1 chat support and push notifications are becoming more and more important for companies. 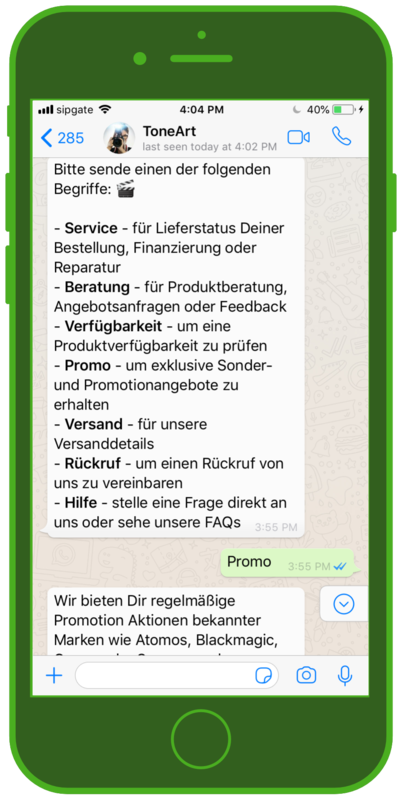 In addition to the customer’s preference for receiving fast support, another major reason is the WhatsApp Business API. Why? 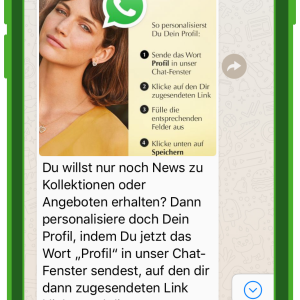 For about six months now, WhatsApp has been using a limited number of verified partners worldwide to enable companies to contact users on the platform with an interface (API) and under clearly defined conditions. 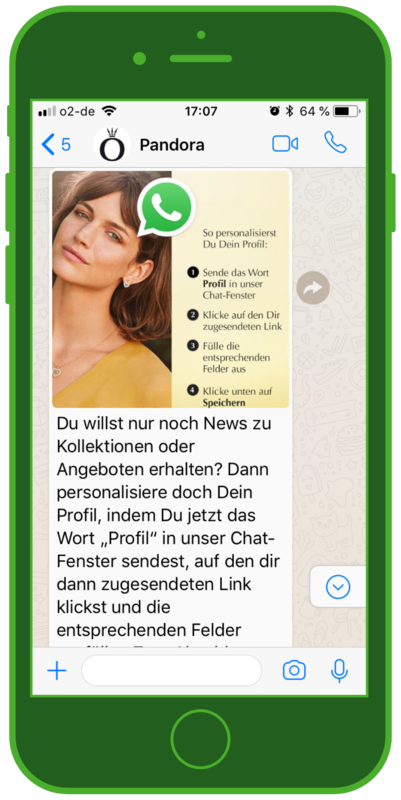 The prerequisite for this is that the users actively agree to communicate with the company, so that customer communication via Messenger is 100% GDPR-compliant. 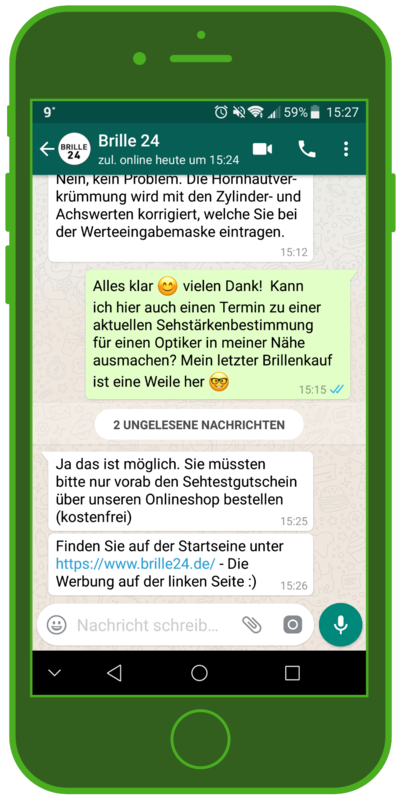 Chats: The number of chats is not limited for companies, but they have to answer fast as the last message in the chat must not be older than 24 hours. After that, the company can no longer write to the customer free of charge. Notifications: Push notifications are relevant for companies outside the 24-hour customer service window to contact customers, but this contact is fee-based and must occur within a tightly regulated framework. The British fashion company Missguided informs customers about sales, latest trends, and everything one needs to know to stay up-to-date with fashion news. 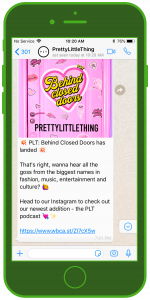 WhatsApp channel subscribers can contact the retailer to enjoy exclusive discounts and to be among the ﬁrst to know about the latest deals and happenings. 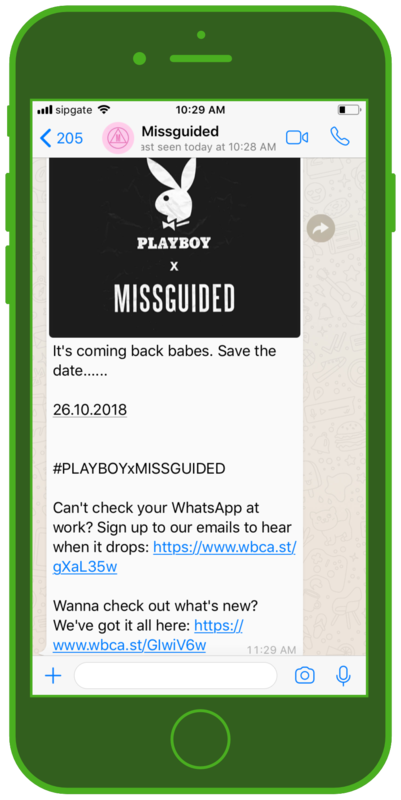 Conclusion: Missguided is aware of the needs of its customers and communicates in a contemporary way via messenger. 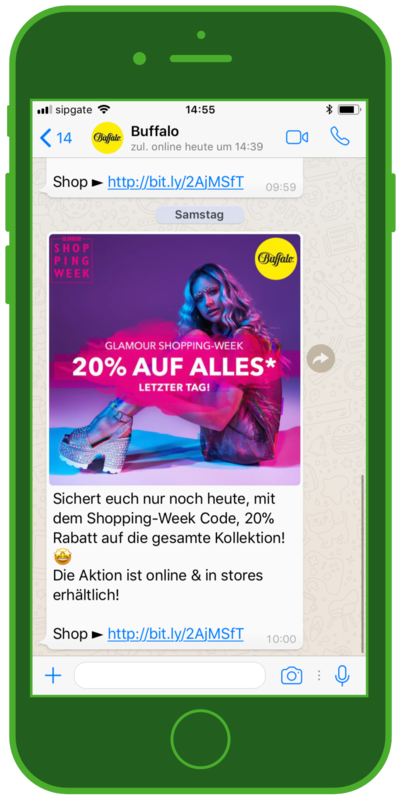 German retailer dm-drogerie markt is, alongside Müller, the most successful drugstore chain in Germany. 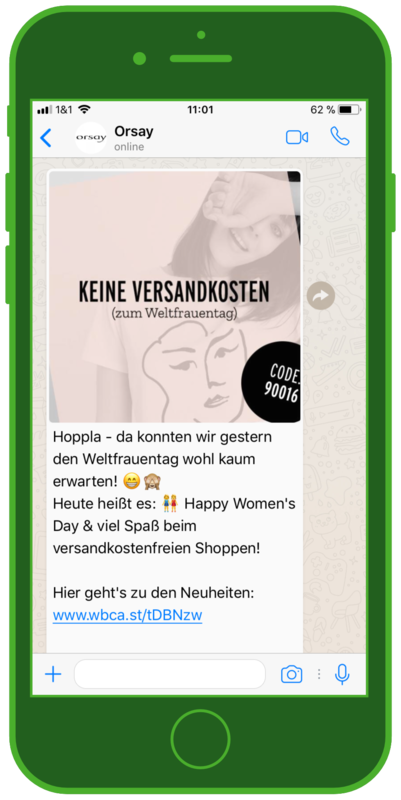 With the help of the service provider Allcop, MessengerPeople jointly developed a Chatbot, or more precisely a WhatsApp bot, for the drugstore, which customers can use to send up to 30 pictures to dm via WhatsApp. 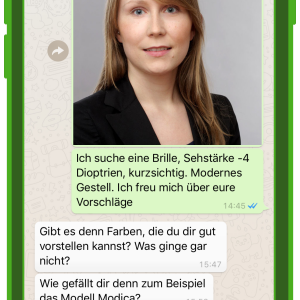 Zoé, WhatsApp Bot, then turns it into a poster or collage that she doesn’t show you before. This means that the finished version is a surprise. Especially during the Christmas season or for birthdays, Zoé’s offer is perfect for customers who like to give away pictures in calendars, photo books or photo collages. 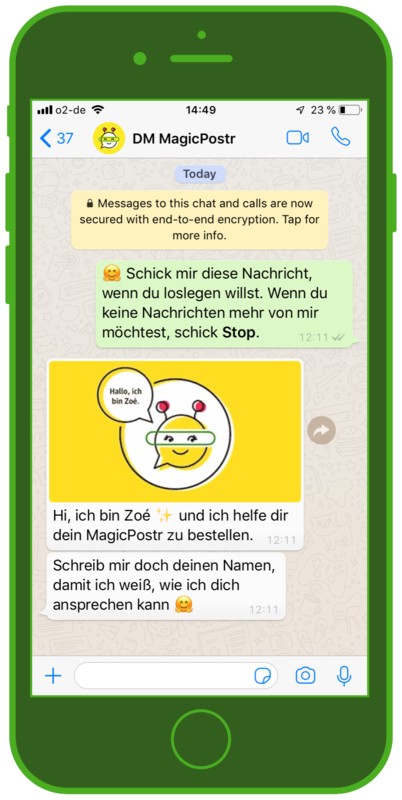 The exciting thing about Zoé and MagicPostr is that the complete process is realized via 1:1 chat in Messenger. 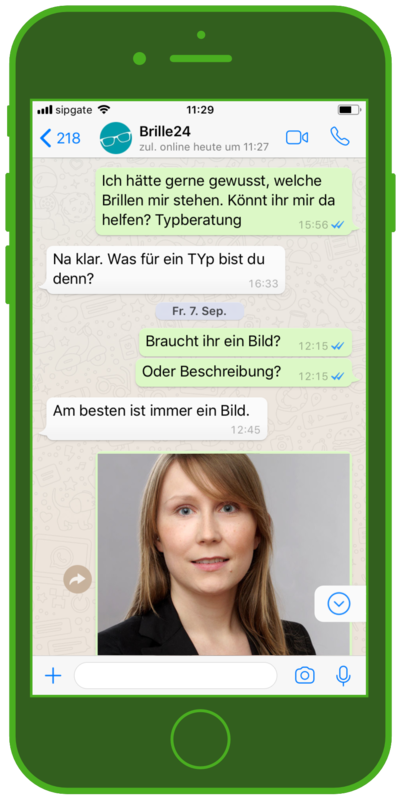 With the help of a number-based menu, customers with more complex questions can also be directly connected to a “humanoid” customer service colleague. 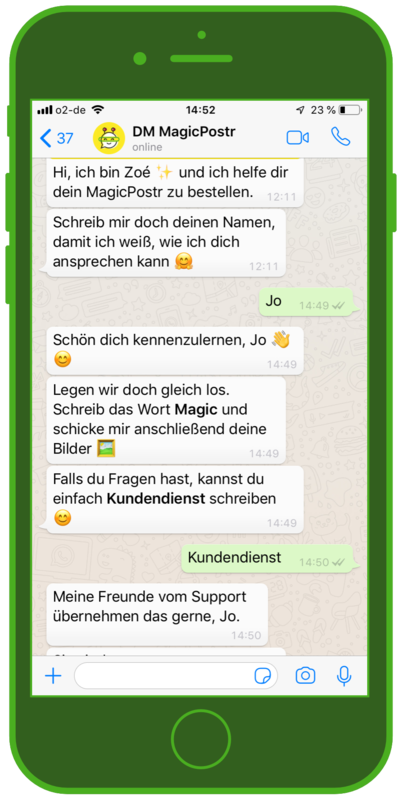 Conclusion: dm relies on the likeable chatbot Zoé for the 1:1 WhatsApp chat. 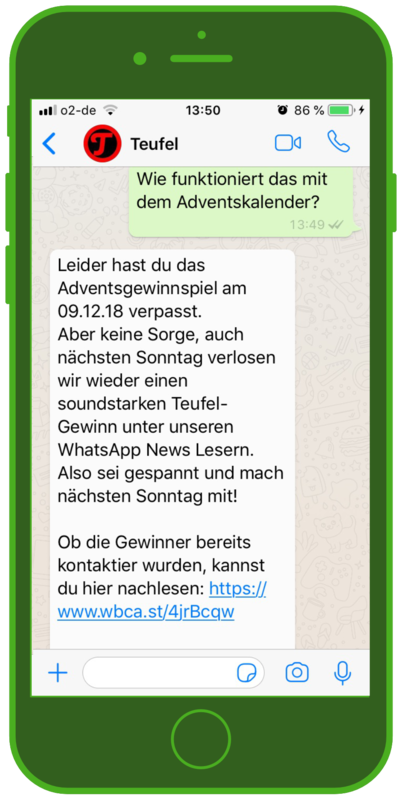 The WhatsApp Bot takes over communication during the entire ordering process and once again demonstrates the advantages of clear and automated communication. 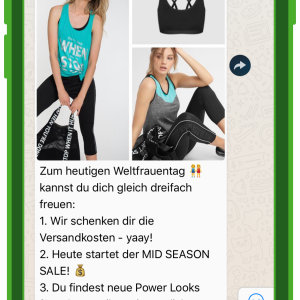 It is fast and effective for both sides: Customers order their “surprise poster” within a few minutes and dm is able to strengthen its 2nd level support through automation, which can be used if the customer wishes. 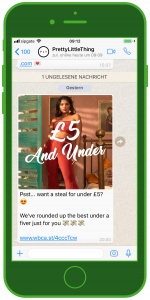 British PrettyLittleThing offers a variety of inhouse designs for women – ranging from clothing to shoes and accessories. 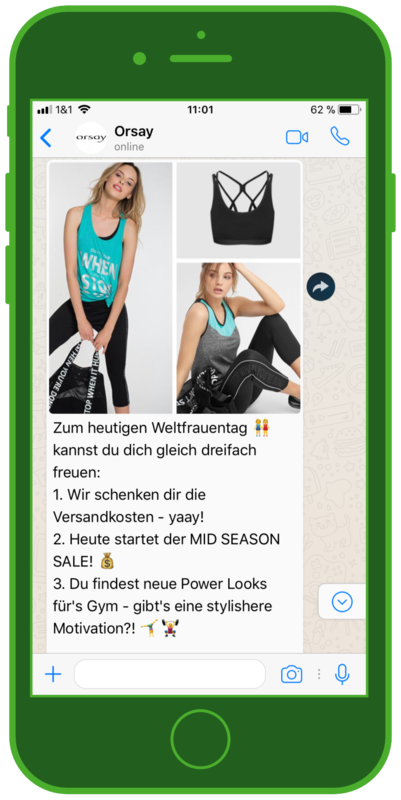 In their WhatsApp channel, they inform their customers about particular deals, best offers. 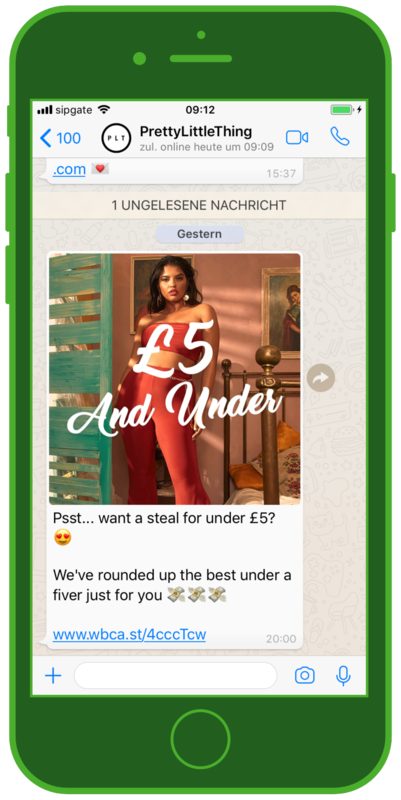 By showing a product picture, the customers get a great idea of what to expect and can get the desired items directly by hitting the link in the WhatsApp chat which leads them straight to the online shop. 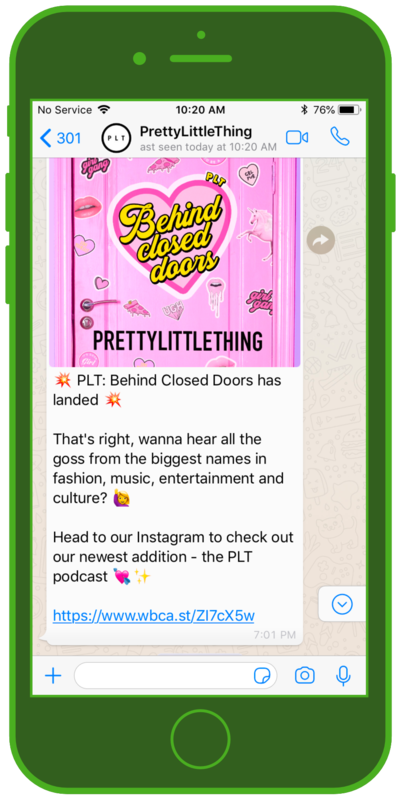 Conclusion: PrettyLittleThing shows how easy yet useful 1:1 Chats via messaging apps are. It helps to increase the target group’s brand loyalty and raises customer satisfaction. 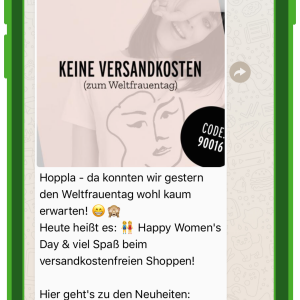 Orsay, the brand for women’s clothing and accessories, uses the 1:1 chat for customer service via WhatsApp. Customers are supported in all matters relating to the brand. 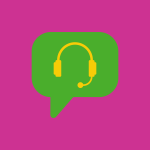 The 1:1 support chat provides information on whether a product is available in a store and/or online shop. In addition, appointments for styling advice can be arranged or special promotions and events are pointed out. 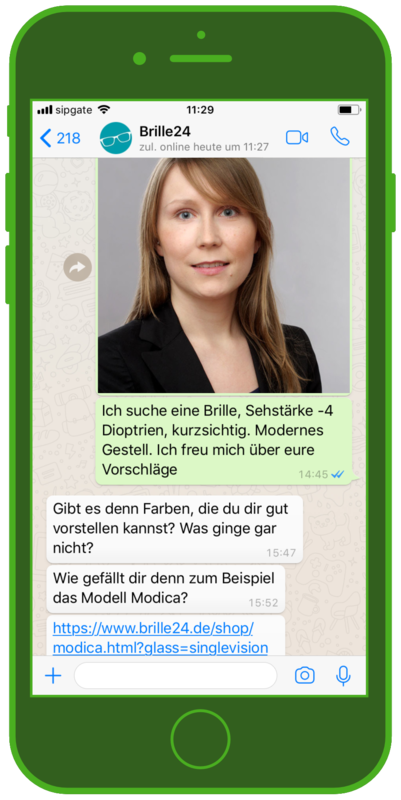 Conclusion: Orsay shows that customer service via WhatsApp via 1:1 chat has long been feasible and useful. It strengthens loyalty to the brand and increases customer satisfaction. It all started with cowboy boots. Today Buffalo is a brand that is known worldwide. 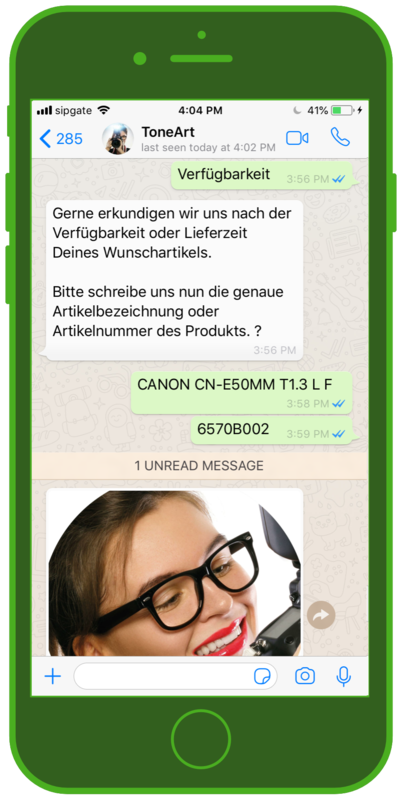 Customer service and WhatsApp connect the company to its customers and answer questions about products, materials and size availability in a 1:1 chat. 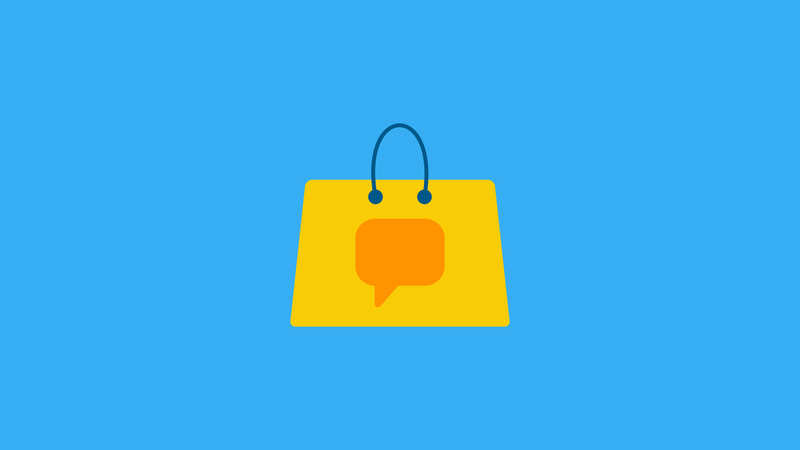 In the 1:1 chat, customers also learn about product availability and store locations. 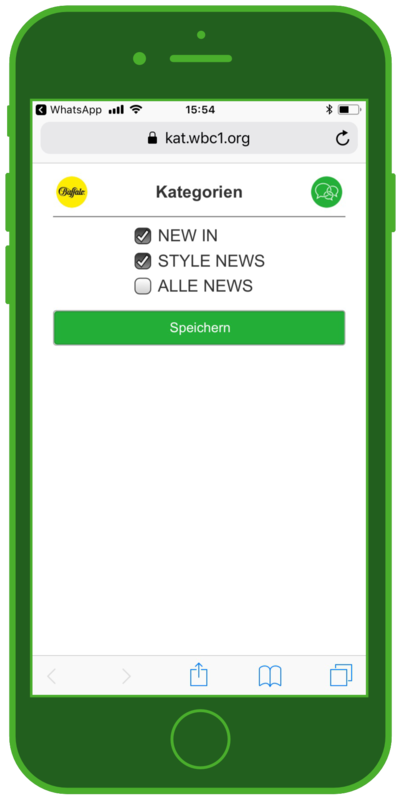 They also receive exclusive advance release dates for new products via push notification. Conclusion: Buffalo’s 1:1 customer service chat allows customers to learn more about the brand and its products through dialogue, increasing customer satisfaction. Originally, PANDORA was a jewelry store in downtown Copenhagen. Today it is a company with concept stores all over the world and a multilingual online shop. 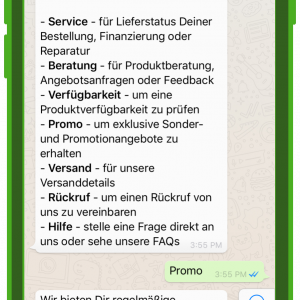 The customer service on WhatsApp is a direct exchange with the customers via 1:1 chat. 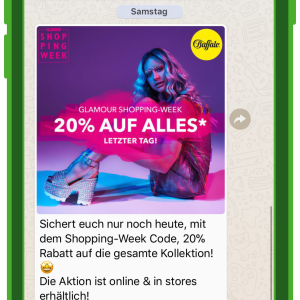 The content can range from product advice, special campaigns for users such as information on stores, product availability queries (online shop, concept stores) to an exchange service, which the company also offers. 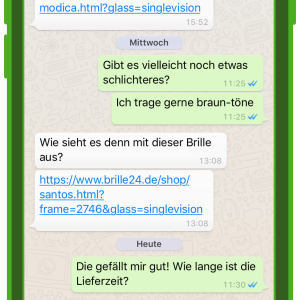 Conclusion: PANDORA offers comprehensive, individual advice in the 1:1 customer service chat on WhatsApp. 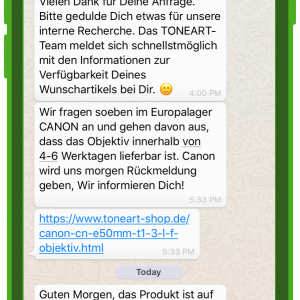 ToneArt, the Augsburg-based specialist store for audio-visual media, offers both customer service (primarily advice via chatbot) and individual 1:1 chat. 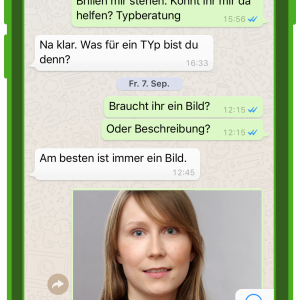 The chatbot is responsible for 1st level support and aggregates the essential data of the customer inquiry, such as the type of inquiry, product numbers, phone number for callback service or the order number. For further dialogue, especially with more complex questions, a service employee will join and introduce and explain the solution in a personal 1:1 chat. 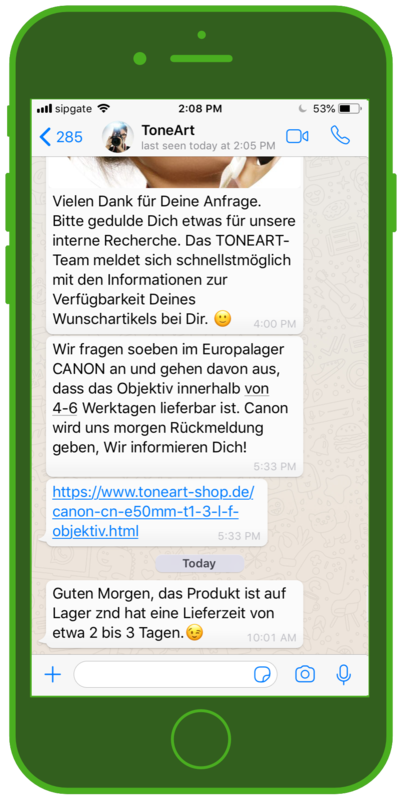 Conclusion: ToneArt offers excellent WhatsApp customer service because of its efficiency. The hybrid solution is “state of the art” in terms of customer service via Messenger. The result for the company and its customers is a faster and more solution-oriented process for processing customer enquiries. Curious about the features? 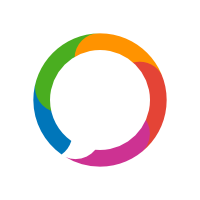 Test the Messenger Communication Platform with your 14-day free trial now. 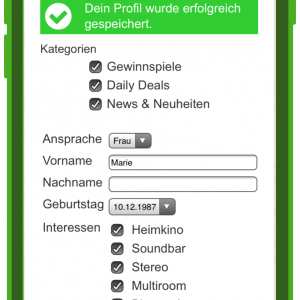 The Berlin company Teufel Lautsprecher offers customer service on WhatsApp. This includes a 1:1 chat to answer questions and help with problems. 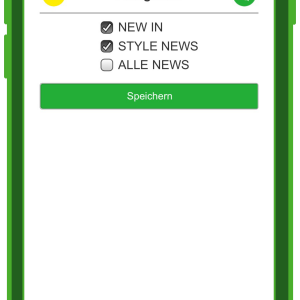 In addition, users are provided with product updates via push messages. At the same time, the channel is also used for pre- and after-sales support by the brand. 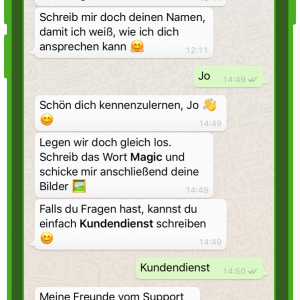 Conclusion: The well-known loudspeaker brand Teufel relies on individual 1:1 chat support for its customer service via WhatsApp. This can be time-consuming, but has the consequence that customers feel valued by the brand and their identification with the brand increases. 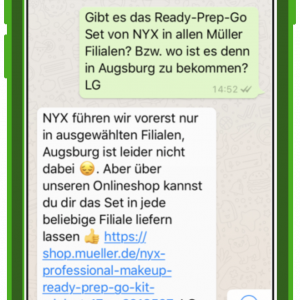 The well-known drugstore chain Müller currently uses three online channels: Facebook, Instagram and WhatsApp. 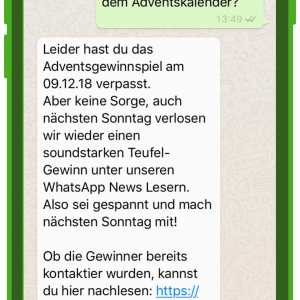 This makes Müller actually one of the first retailers to start offering growingly popular WhatsApp customer service. 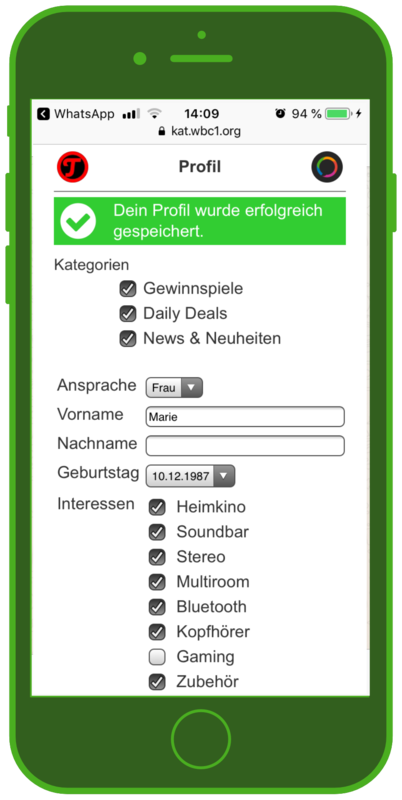 The 1:1 chat supports personal consultation, for example about product availability, or help with product questions, e.g. about ingredients. Müller’s feedback takes place within 24 hours of receipt of the customer inquiry. 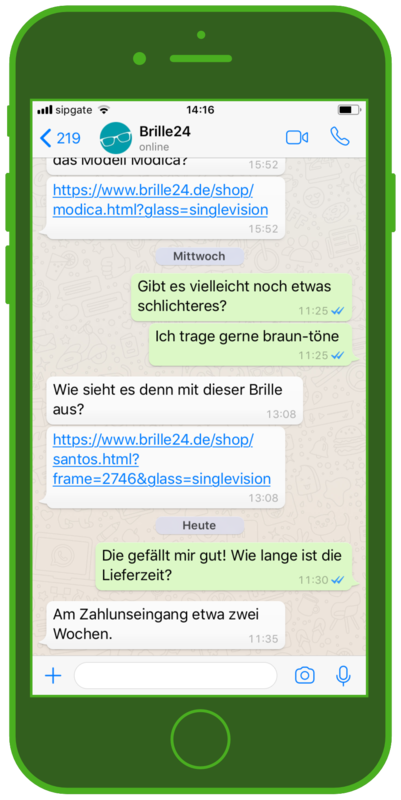 Conclusion: Müller is consistent and sets itself the goal of answering customer chats within 24 hours using WhatsApp. 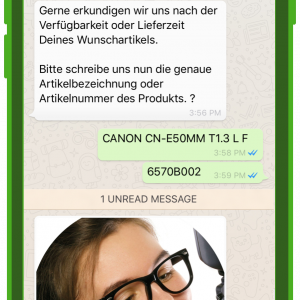 This fulfills an important criterion of the WhatsApp Business API. The advantage lies in the fact that the use is learned and easy even for older customers. They don’t have to call or sign up for their email service. 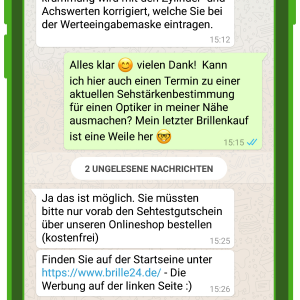 Conclusion: In contrast to many other brands, the online optician Brille24 is a prime example of “really” putting its customers at the centre of its activities (keyword: customer centricity), as can be seen, for example, from the fact that the online optician also helps to find an individual appointment for a local optician. The e-commerce industry is, along with radio, newspapers and TV stations, one of the 1st movers in customer service and WhatsApp. 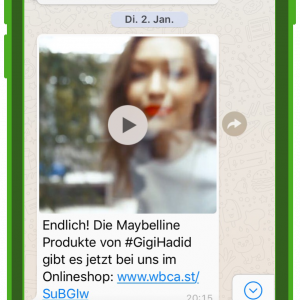 The “real-time” aspect, a main characteristic of messaging apps such as WhatsApp, Apple Business Chat, FB Messenger & Co., has proved itself to be an enormous advantage. Messages sent in real time to customers’ smartphones don’t require the detour of a programmed news feed a la Facebook & Co. 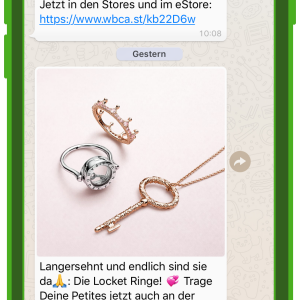 Especially for e-commerce, customer service via 1:1 chat on WhatsApp is a great advantage to improve the customer relationship and to emphasize the added value of the brand. 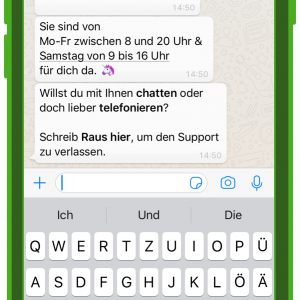 “Would you rather wait 10 minutes in the phone queue or wait 10 minutes for an answer on Facebook Messenger?” asked Stan Chudnovsky, Head of Product FB Messenger, at DMEXCO 2018. The answer is obvious. 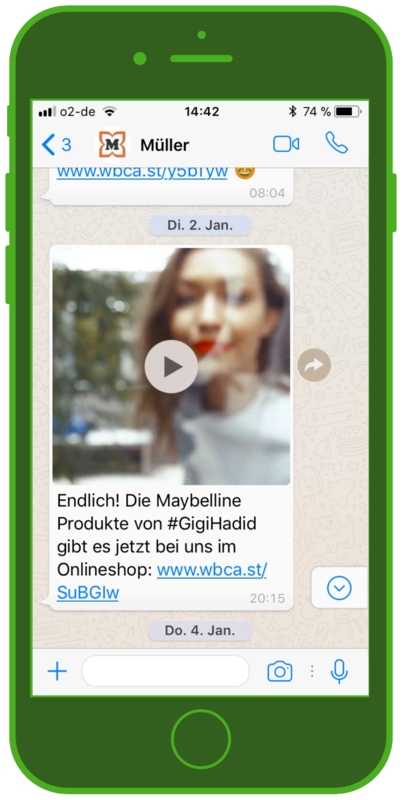 Synchronous and asynchronous communication via messenger has an advantage over telephone, e-mail and the like.